Thank goodness it's Friday! Which today means a day in my jammies, blogging, writing a paper on the history of journalism, watching telly and drinking copious amounts of hot chocolate. Perfect. I'm also going to nip into town to pick up an advent calendar as next Saturday is the first of December!! :) Which means I can now fully justify watching Christmas movies, wearing my reindeer onesie and drinking mulled wine, yay! But it also means the start of the Christmas party season! I already have three Christmas nights out planned, and one in the process (we're struggling to agree on a date!) two work nights out and the #bloggerschristmasparty which I'm super excited about, on the 10th of December. And Christmas parties of course means party outfits, so when I heard about the 'Xmas Party Outfit Challenge' run by Fashion Vouchers (here's the link to the entry page) a challenge to put together a Christmas party outfit for under £100, I jumped at the chance! I decided to choose my outfit from ASOS, mainly because they have a really selection of party dresses, and dresses long enough (I'm a bit of a giant and struggle to find dresses I feel comfortable in...) luckily I hit the jackpot and found an amazing, oxblood, all over lace party dress. Firstly the colour is massively on trend and the style is perfect for me; falling just below the knee, nipping in at the waist and an empire link skirt, in fact I'm so tempted to buy it!! I've kept the accessories fairly simple, with gold sparkly shoes (a bit of a contradiction there! 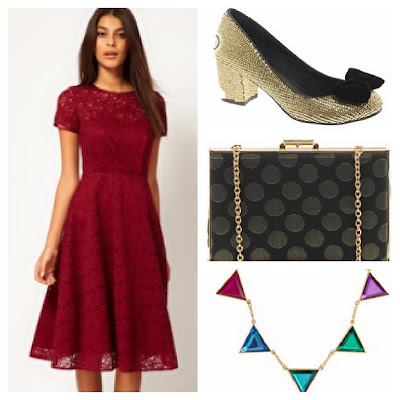 ), a jeweled bunting necklace, and black polka dot box clutch. And luckily I managed to come in on budget (with the help of student discount, as I'm a student!) just! My outfit came to £100 exactly, spooky huh? The bag is £22.50 on sale too. Added all up totalling £100! So what has everyone else got planned for the party season? I have a few outfits which I'm looking forward to wearing, including my Gok Wan bodycon dress, which I haven't worn yet and is gorgeous! As well as a few other party 'pieces' I have lurking on my clothes rail :) Happy Friday all, I'm off to make a cup of tea and a toasted crumpet, sweet.